Representative Honours: 4 Full Caps (1982); Irish League: 3 Caps/1 Goal (1982-1986); League of Ireland: Representative. Club Honours: (with Finn Harps) League of Ireland Runner-Up 1977/78; (with Coleraine) Irish Cup Runner-Up 1981/82, 1985/86; Ulster Cup Winner 1985/86, 1986/87; (with Derry City) League of Ireland Champion 1988/89, Runner-Up 1989/90; FAI Cup Winner 1988/89, Runner-Up 1987/88; FAI League Cup Winner 1988/89, 1990/91, Runner-Up 1989/90. An accomplished midfielder or striker, Patrick ‘Felix’ Healy possessed a passing ability perhaps unmatched in the Irish game. He emerged in the Sligo Rovers first-team as a teenager, displaying a coolness on the ball which belied his young age. In the summer of 1976 he transferred to homeless Distillery, a club suffering the most turbulent period in their history, and perhaps inevitably some dreadful results. Healy didn’t even last the season, and in March 1977 he was back in the League of Ireland with Finn Harps. Some impressive form with Harps brought runners-up medals in the League of Ireland and the Tyler All-Ireland Cup, and in October 1978 an £8,000 move to Port Vale. 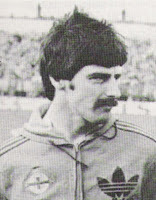 After two seasons of Division Four football, Healy returned across the Irish Sea, signing with Coleraine in July 1980. His form with the Bannsiders during the 1981/82 campaign brought the club to the verge of a League and Cup "double", before they lost out to Linfield on both fronts. The disappointment was no doubt tempered by a Player of the Year double, and a call-up to the Northern Ireland squad. Healy made his international debut in an experimental line-up which drew with Scotland in the British Championship, and won his second cap the following month as Northern Ireland finished their World Cup preparations in the worst of fashions, with a 3-0 defeat by Wales. 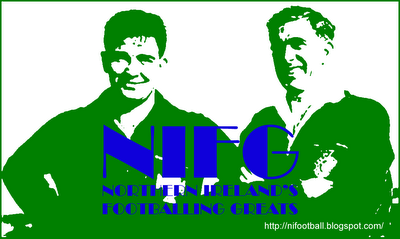 Healy must have done enough to impress Billy Bingham, who included him in the World Cup squad for Spain. He played once at the Finals, coming on as substitute for Martin O’Neill in a 1-1 draw with Honduras. His fourth and final cap was won in the first post-World Cup game, as Northern Ireland lost 2-0 in Austria. Continued good form with Coleraine over the following seasons brought Healy two Ulster Cup winner’s medals and another Irish Cup Final appearance, his penalty strike not enough to prevent Glentoran winning the 1986 Final 2-1. Healy was also a regular choice for the Irish League and won three caps – in a 3-3 draw with OFK Belgrade (representing the Yugoslav League) in 1982, and twice against the League of Ireland, a 4-0 win (in which he scored) in 1984 and a 2-1 defeat in 1986. In 1987, despite being past his thirtieth birthday, Healy moved to his hometown club, Derry City. He was to become a Derry City legend, helping them to a clean-sweep of League, FAI Cup and League Cup in 1988/89; the club’s first major honours since their Irish League days, 23 years earlier. In October 1993 Healy returned to Coleraine as player-manager, taking over from Iam McFaul, before returning to Derry City as manager in December 1994. In a little-under four seasons in charge at the Brandywell, Healy led Derry to League and FAI Cup successes, before resigning in 1998. Healy remained outside football until becoming a surprise appointment as Finn Harps boss in 2004. His first season at Finn Park brought long-awaited promotion, as champions of the First Division, but as the club struggled to make an impact in the Premier League he was sacked in July 2005. In 2011 he returned to Harps as Director of Football. As well as his footballing talents, Healy is also a noted singer, and has recorded a number of songs, appeared on stage and presented his own radio show. Summary: 2(2)/0. Won 0, Drew 2, Lost 2.